Brooklyn Nine-Nine Review: Will Jake and Amy Have Kids? Jake and Amy reach a crossroads on Brooklyn Nine-Nine Season 6 Episode 12, when they realize they have opposing views on having kids. Will their marriage survive? On Brooklyn Nine-Nine Season 6 Episode 11, Jake is forced to open up about his feelings, and Captain Holt attempts to have dinner with Rosa and her girlfriend. On Brooklyn Nine-Nine Season 6 Episode 10, Jake proves that there's no line he wouldn't cross for his best friend. But did he take things a step too far? Amy ends up in a competition with her least favorite brother, David, while attempting to help clear his name. Read on to find out how it all goes down! Jake faces the challenge of helping Charles break free of his ex-wife's influence. Find out how it goes in this Brooklyn Nine-Nine Season 3 Episode 11 Review. It's a dream come true for Jake on Brooklyn Nine-Nine Season 3 Episode 10 when he, Boyle, and Gina find themselves in a real life Die Hard situation. Who was the hero? Can Jake help take care of Terry's pregnant wife when everything seems to go wrong? Find out in our review of Brooklyn Nine-Nine Season 3 Episode 8. Jake and Amy worked their first case together on Brooklyn Nine-Nine Season 3 Episode 7 and it didn't exactly go as planned. Did their relationship survive? 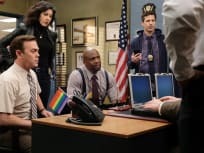 On Brooklyn Nine-Nine Season 3 Episode 6, Jake and Charles try helping Terry relax with a guys' day in the woods, but things don't go exactly as Jake hoped they would. Who is crowned the amazing detective-slash-genius king of the Nine-Nine during their annual Halloween Heist? Find out in this Brooklyn Nine-Nine Season 3 Episode 5 Review. Can Jake and Captain Holt secretly work a serial killer case without their superiors finding out? Find out how that works out in this Brooklyn Nine-Nine Season 3 Episode 4 Review. And now, a message of hope. Everything is garbage. You find something you care about, and it's taken from you. Your colleagues, your dream job, your mango yoghurt. Never love anything. That's the lesson. Permalink: Holt: And now, a message of hope. Everything is garbage. Brooklyn Nine-Nine Season 6 Episode 14: "Ticking Clocks"